Years 2015 and 2016 have been very important in terms of what they have offered to bring clarity on the jurisdiction where suits/ civil proceedings related to Trademark and Copyright can be instituted. IIPRD has written one article discussing some of these cases. Intent of the instant article is not to discuss facts of those cases again but to understand the latest position on the applicable jurisdiction for Trademark and Copyright disputes. Section 62 of the Copyright Act, 1957 (hereinafter referred to as section 62), Section 134 of the Trademark Act, 1999 (hereinafter referred to as section 134) and section 20 of Code of Civil Procedure (CPC), (hereinafter referred to as section 20) 1908 govern the applicable jurisdiction. (2) For the purpose of clauses (a) and (b) of sub-section (1), a “District Court having jurisdiction” shall, notwithstanding anything contained in the Code of Civil Procedure, 1908 (5 of 1908) or any other law for the time being in force, include a District Court within the local limits of whose jurisdiction, at the time of the institution of the suit or other proceeding, the person instituting the suit or proceeding, or, where there are more than one such persons any of them, actually and voluntarily resides or carries on business or personally works for gain. Explanation. —For the purposes of sub-section (2), “person” includes the registered proprietor and the registered user. Section 62 and Section 134 are pari materia. It is important to note that both of these sections are ‘inclusive’ in nature. They are categorical in nature. The inclusive nature of these sections can be inferred from the word ‘include’. To better understand the intent and effect of section 62 and section 134, let’s understand what recourse plaintiff would have in absence of these sections and what recourses they have now with these sections. In absence of Section 62 and Section 134, having resort to section 20, plaintiff may be able to file the suit of infringement against the defendant only at the district court (in case of copyright) or at a court that is not inferior to the district court (in case of trademark) within local limits of which cause of action wholly or in part arises, or where defendant resides, carries on business or personally works for gain. But when we read Section 62 and Section 134 with section 20, plaintiff can also file suit for infringement at a place where he resides or carries on business or personally works for gain. Plaintiff is not barred to file suits at courts having jurisdictions where cause of action has arisen wholly or in part or at court having jurisdiction where defendant resides or carries on business or personally works for gain even if plaintiff is not residing or carrying on business or personally working for gain in any of those jurisdictions. Section 62 and section 134 are not in derogation of section 20, instead they just provide an additional forum for the suing to the plaintiff. Such interpretation of section 62 and section 134 has been confirmed by division bench of Hon’ble Madras High Court in M/S. MICRO LABS LIMITED, REP., BY ITS COMPANY SECRETARY V/S M/S. ERIS LIFE SCIENCES PVT. LTD., decided on Tuesday, September 15, 2015. 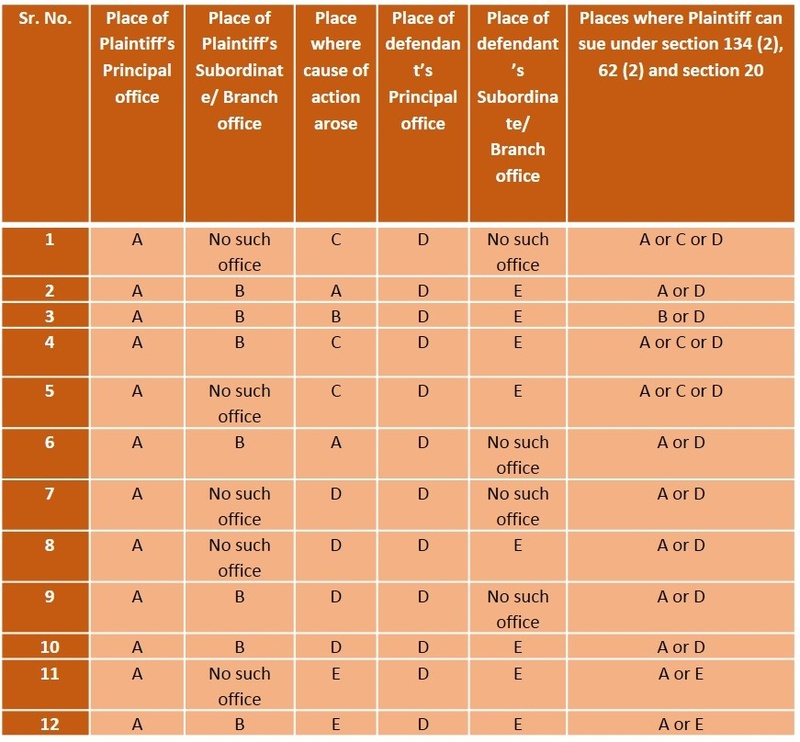 By drawing analogy from the case laws read with section 134, section 62 and section 20, below is produced a table that discusses the applicable jurisdiction that may arise in different cases. what are applicable of jurisdictions between Various IPR infringement and IT act cases dispute.